Isaac had an interesting start to his career, picking up the game while on Erasmus in Austria, before encountering the Dublin Ultimate scene, and quickly playing for upper level teams of the time, UCD and Craic, before finding his true home with Johnny Chimpo. In China since 2011, we managed to negotiate the Chinese firewall to bring this one to you!Your background, sports played prior to ultimate? Mostly soccer, a few years of tennis, some cross country running (non competitive), and a spell of hockey one year at school. When did you start? At UCD? No, in Graz, Austria, as an Erasmus student. Stadtpark to be precise, one of the most amazing parks in Europe. I met the local team there almost by accident. After a few weeks of joining them at training – they were a very welcoming bunch – they invited me along to Paganello in Rimini, as an onlooker and guest of their team. I couldn’t have asked for a better introduction to the game, still learning how to throw while watching layouts in the sand and guys freestyling in the wind, not to mention the beach parties at night. While there I met an Irish-Canadian lady, I forget her name, but she told me about the Irish ‘Pookas’ team. I said I’d look them up for sure when I move back home. That was back in the Summer of ‘99 I guess, not long before I moved back to Dublin to finish my degree. What was UCD like when you started? Coming from the exotic world of continental European ultimate, it took a bit of getting used to. Different set of people, slightly different way of playing. I got to know fellow UCD heads Oisin, JD and Big Al, who I guess must have helped pioneer the game there, with help from yourself, Brian MacD and a few others. It was a moment of transition I suppose looking back, the beginning of something that would keep growing bigger and bigger. I guess the team probably grew to be much bigger very fast, and having a pookas training on the campus at weekends would have helped a lot to get critical mass. You played Prague as a handler, 01, how did you find it? I have very hazy memories of those games but enjoyed the tournament tremendously, and got on really well with the whole team. The soviet era college campus was a really cool setting. I remember being shouted at a lot on the field by the infamous Dec Moore . And Oisin Flanagan from the sidelines, he had broken his hand at training a week before the tournament, what a loss to the team that was. I also remember the great surprise of seeing my mate Charlie showing up at the tournament out of the blue, having travelled all the way over from Ireland, only to get completely lost in the city, and finding himself in old Prague restaurants having to mimic the action of throwing a frisbee out of desperation to communicate with the locals, who were speechless of course. Your nickname was the iceman, why? You know that classic 80’s song ‘You’re as cold as ice’ …Actually I have no idea, I never liked that nickname, too tacky. No idea where it came from, probably Steve or Brian McDevitt. UCD, then Chimpo? Why Chimpo and not Broccoli? What were your highlights of playing for JC? I just couldn’t stand the green colour they chose for their strip. Ah no, I don’t think I was ever asked to play for them. They probably wanted a more serious player. Highlights for the JC experience would have to be the Sligo and Cork tournaments for me, especially Sligo as its such a beautiful little town. I liked the trip to Leeds as well, any chance to visit a new random place was always a pleasure. .
Best tournaments and best game played? The ones in Prague, France, Portugal and Belgium, especially Ghent and Brugge. They were all amazing experiences. 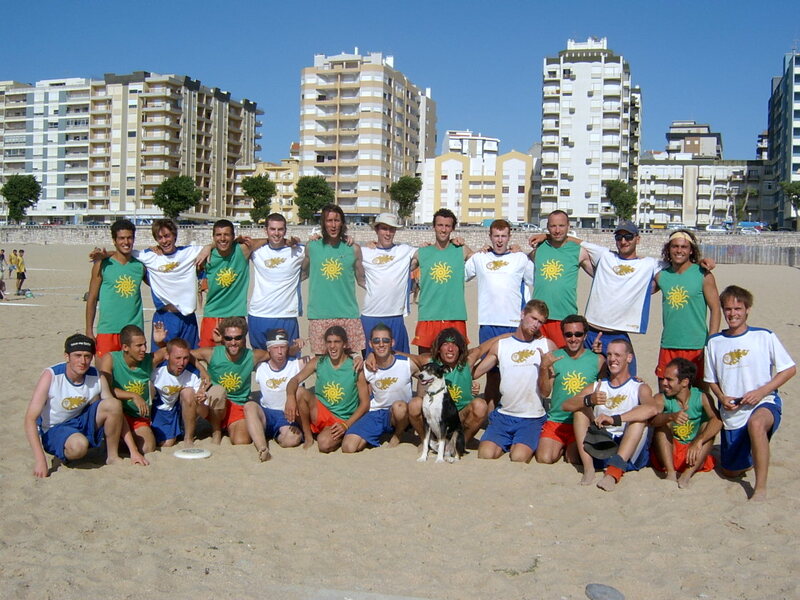 Winning the spirit of the game award at Paganello, Rimini in 2003 with Pookas was a great honour. So many great memories its hard to pick out the best ones. In terms of best game perhaps the Cork semi-final in 2008 where JC beat Brocolli. I have a video from the winning point and handshake afterwards. JC were unstoppable back then, going on to win the tournament hammering the Belgians in the final. You announced your retirement earlier than most why? Did I? You have a better memory than I! I think I just gradually stopped playing after the people I liked playing with stopped playing. I suppose you get to a point when you realise you are no longer as young and fit and the people you knew before have all left or stopped playing and you don’t have as much in common with the new younger and faster crop of players that get bled in. You were saying you’re not sure 100% ultimate is a sport, interesting, what did you mean by this? I don’t think ultimate is not a sport. Not sure where you got this from. You also misquoted me on this in your interview with Reuben. I think it’s as much a sport as rugby or snooker is. If people wanted to introduce a referee’d version as an alternative format, I’d probably have no problem with that also. China now, you play a bit of GAA? How does it compare? Well you have the same basic challenge to perform under intense aerobic pressure. That’s the main similarity. Solo-ing while running and giving or taking a successful pass when you are totally out of breath is pretty much the same basic challenge as you have in ultimate. You could argue that ultimate is easier because you can take a few seconds to get your breath back when you catch the disk. In any case both are different to a sport like soccer, where you can relax a bit during the game and each half lasts quite a long time. The pace is always much faster in ultimate and gaelic football. 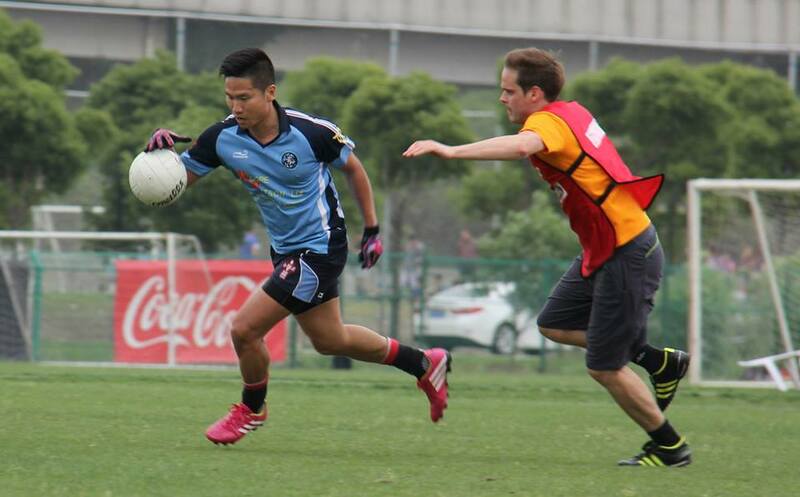 Here in Asia gaelic football is generally played with smaller sized teams and on smaller fields. The games are short (usually about 7 minutes a half) and players rotate constantly because of the need to take a breather. There’s a big social dimension here too. In Shanghai women and men train together so the level is fairly relaxed. It draws in a very diverse set of players too from all over the world which is fascinating for an Irish person to see. On the ladies teams there are often more non-Irish than Irish players. This year the All-Asia Games will be held in Shanghai with about 1000 players descending on the city. That is going to be a tough one for the club to organize and manage. Hows it going living in China, what do you like, what do you miss? The odd time I might miss the calm of Dublin, and the people of course, also the vibrancy and compactness/walkability of the city centre. Everything is more spread out here in Shanghai. It’s still a very exciting place to live. There’s an incredible energy in the city, people from all walks of life. It’s a place with lots of opportunities and massive contrasts between rich and poor, old and new etc. China is an interesting place to be right now, its changing so fast but traditional culture is still visible everywhere. Its such a vast and diverse country there’s always some place yet to be discovered with an interesting story behind it. Good work with these interviews, I’ve enjoyed reading them. Looking forward to seeing more, including your own, someone needs to get that sorted!